When life hands you lemons... make lemonade! This collection is full of inspiring true stories from others who did just that, and will help you make the best of any bad situation. You will find inspiration, encouragement, and guidance on turning what seemed like a negative into something positive in these 101 sweet stories of success! 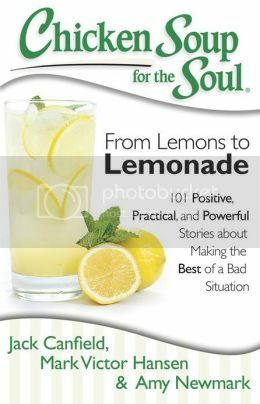 Are you a fan of Chicken Soup For the Soul books? I love the books and I always have one on the coffee table to read whenever I want. Anyways I like liked this book just as much as most of the ones I have read and I have to say I have read many of these books. This book is full of inspiring stories that I enjoyed and I am sure you will too. You can purchase this book in stores right now.